Related links to "Stellar Deluxe Sleep Mask - Black"
Customer Review for "Stellar Deluxe Sleep Mask - Black"
I didn't have high hopes I was going to get on wearing a sleep mask (never having worn one before) but i was surprised - this mask is light and so comfortable, love it! It's also brilliant because you can sleep on your side with it and it doesn't dislodge. Brilliant piece of kit for my sleep hygiene routine, very happy. So glad you like it. Thanks for letting us know. This is my 2nd time buying from sleepstar as I can't use any other mask now. So comfortable and functional I adore them. Also very quick delivery to Ireland. Thank u sleepstar. Any tips on washing them?? Definitely helps me drop off when trying to sleep in the middle of a gloriously sunny day after a night shift. Small amount of light around the nose area but not a problem and sometimes the Velcro gets stuck in my hair, but rarely. The eye holes make it feel like you have nothing on and won’t smudge your makeup if you need a midday nap. Overall good value for money and achieves a well needed purpose for me. A little bit of light still creeps in at the bottom unless you pull it uncomfortably tight but with your eyes shut you do not see this so it is not really a problem. Very pleased with it. Thank you for your feedback. Please make sure you have the nose pieces pulled down to maximise the blocking function. After reading the reviews on here, I purchased this mask. However, when it arrived I was skeptical. It felt like good quality, but when I put it on in my kitchen, I could see strips of light coming out the bottom. However, I thought I’d give it a whirl nonetheless. I’m so glad I did. When you lay down, no light shows through underneath, I guess because your cheeks aren’t pulled down with gravity. It’s super comfortable and secure, there’s no movement and it feels pretty cosy to wear honestly. What I love is that the sides of this mask are thick, and there’s no light coming in that way which is what I found with other masks. So glad I didn’t have to spent £40+ to get a luxury mask because I’m so happy with this one. Recommend! Very good product, extremely satisfied. Extremely satisfied a very good product. Very comfortable and no pressure on the eyes. So snooze with mascara on not an issue! Great blackout , better than others I’ve used. My only slight niggle is one mentioned before on another review. Not so easy to get a really good fit on a small head with shiny hair! Arrived very quickly, no problems with ordering or delivery. Comfortable to wear. Quite effective at excluding light. Useful for travel and bright mornings. Purchased this in hope of a good nights sleep. I live in Scotland and haven’t had a good nights sleep for a long time for varying reasons. Tried the sleep mask and it was brilliant. I had been pulling the covers over my head to cut out the light but now I get a really good sleep every night and I am much more like my old self. I only wish I had got it sooner. Nice design and fairly comfortable. Material a little stiffer than I would like, but maybe it will soften in time. Keeps light out when strapped closely, but this does reduce room for eye movement slightly. Excellent value & customer service! I purchased two of these, unfortunately only one arrived. This morning, less than 24 hours later, the replacement arrived by Special Delivery. What excellent customer service! Last night I tried the mask for the first time. The light was blocked out and, apart from my dogs waking me, I slept very well. The mask sits away from the eyes so it feels totally natural. I did have to adjust the straps a couple of times, but that was so easy. Soft, comfortable mask that blocks out the light perfectly. Very comfortable to wear and blocks light totally for me. This is a fab product. Blocks out the light and is comfortable to wear and fits well around the eyes without pushing into them or squashing them closed - I can open my eyes behind the mask easily. The only negative I have is that the elastic strap slides up my hair while I sleep and I have to work hard to anchor it in place. My hair is straight and obviously shiny which doesn't help it stay put. Perhaps a velvet or faux suede sleeve could be included to stop the movement and help to hold it in place. I might just " Macgiver" something like that myself. Otherwise it's great - even kept me sleeping in Spain this summer in a room with a huge window, and no black out blinds to stop the light streaming in from the early hours. Works perfect, and washable! Now more deep sleep for me in the condition of close midnight sun in Sweden. Better than other models I have been testing. Perfect for a good nights sleep! This thing really does block out one hundred percent of the light. It's great for sleep, if light bothers you during sleep, this is really good as it's so comfortable and it doesn't move around on your face, unlike cheaper products. The elastic isn't too tight either, and due to the shape it's not pressing against your eyelids so you can still blink and twich as you please. I have used it every night since i received it and i don't think i will use any other make. This is the number one! (It doesn't fall off in your sleep either, you wake up in the morning with it still firmly on you face. I was excited to receive this after so much research funding the perfect mask, unfortunately I don't like it all. I think my head is too small as it simply doesn't fit right. It kept sliding up onto my forehead. I tightened the strap and this made the mask tilt at an angle letting all the light in. It's also too stiff and doesn't bend around my face. I will say however that my partner tried it and it fits him perfectly so ?? Thanks for the feedback. The good thing about the velcro head band is that it is fully adjustable to any head size. You move the velcro strap to secure it for a secure fit. Excellent product, provides me with the blackout that I need for a good sleep. Really comfortable I don't even feel it on my face. I like that I can open my eyes with the mask on , I don't feel restricted. Bought as a present for my wife. Such good feedback I'll be getting one for myself. A++ would trade again. 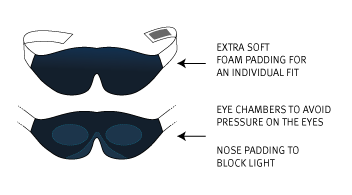 Very comfortable sleeping mask, great material that covers your eyes perfectly. no light comes thorough and allows you to sleep comfortably. Very effective and comfy sleep mask. Would recommend. Bought as a gift for my daughter and she loves it, comfy and excellent black out. I was slighlty dubious about the product when it arrived as it wasn't as soft as i imagined it would be, however, once i put it on the blackout was intense and i had a brill nights sleep! my old sleep mask kept coming off in the night and this one stays exactly where its meant to due to the curvature of it and it stays on all night, i would definatley recommend it and will be buying a spare! Bought it as a replacement for my wife's old mask. This is much comfier and softer than previous ones. This is the stellar mask I have bought. I find them super comfortable and love the fit it blocks 100% of light out. I have tried other brands but they don't hold up to the quality and feel of the stellar masks at all. Won't be the last one I'll buy. Brilliant and really blocks out light. Comfortable to wear and adjusts to my tiny head. Great design. Definitely recommended. It took me more than 10 to find the one for me. I have bought sleep masks from 2 or 3 pounds - up to £24 and fancy as some looked they were all flawed in some way, either poor light sealing, pressure on the lids, irritating materials used, uncomfortable fitting and cause sweating. With the 'Sleepstar' I have found as close to perfection as I am likely to find. It is in the mid price range and I have bought a second to allow for regular washing of them. I could not be more happy with an item as I am with these. I am a devotee of eyemasks for sleeping and have tried all different types. But this mask is the most effective in blocking out light and the padding across the bottom also has a really relaxing effect. Perfect for those daytime naps too! Fits nicely around the nose. Light weight and soft.